1 Heat 1 teaspoon oil in a heavy pan over high heat. Pat meat dry; sear until slightly browned, 1 to 2 minutes per side. Remove meat from the pan, wrap in aluminum foil and let rest about 10 minutes. 2 Wipe the pan clean with a paper towel. Lightly toast sesame seeds in dry pan over medium-high heat, then transfer to a plate and let cool. 3 Squeeze juice from lime. Peel ginger root and cut into pieces, then squeeze through a garlic press, collecting juic in a small bowl. Add sesame oil, remaining canola oil, 1 tablespoon lime juice, mirin and soy sauce. Combine well. 4 Slice the meat thinly and place on 4 plates. Drizzle half of the ginger sauce over the meat. 5 Slice off the ends of the enoki mushrooms and separate into individual mushrooms. Layer the mushrooms evenly over the meat. 6 Rinse mizuna and shake dry. In a bowl, dress mizuna with remaining ginger sauce and season with salt and pepper. 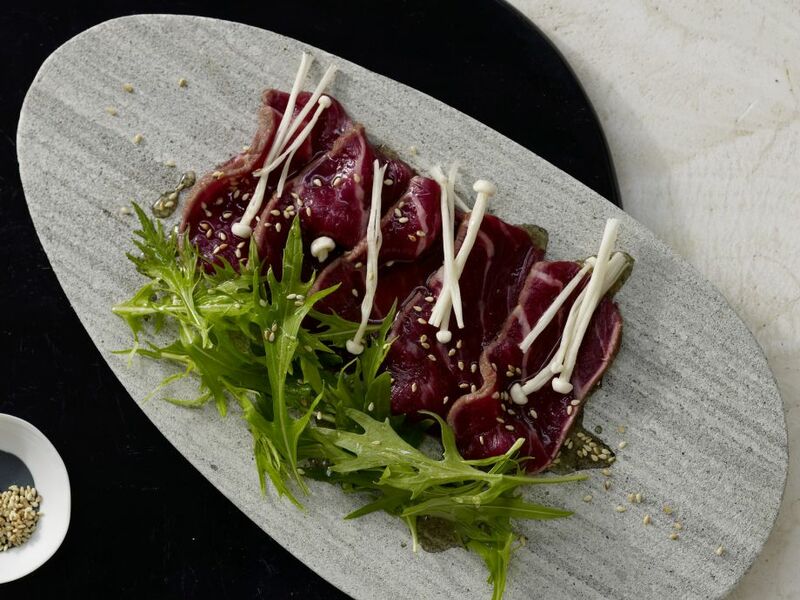 Serve mizuna alongside sliced meat and sprinkle with sesame seeds.